A few years ago, I scanned in a few pages from the Kodansha’s Sailor Moon S TV Magazine Deluxe book. I finally went ahead and scanned in the entire book, to add to the Gallery’s Kodansha TV Magazine Deluxe Book collection. The book explores the beginning of the third season, Bishoujo Senshi Sailor Moon S. It begins with the introduction of Sailor Uranus (Tenoh Haruka) and Sailor Neptune (Kaioh Michiru), and their quest for the Talismans. Death Busters and Witches 5 are brought into this arc as well. Only the first half of the third season is covered in this book. The periodical concludes with the ending of season two, Bishoujo Senshi Sailor Moon R.
I also scanned in an awesome poster of Tenoh Haruka by the company, Banpresto. The poster is actually vinyl, a little bit bigger than the size of a pencil board, and can be framed (It came with plastic frames). It was part of a set of small vinyl posters that Banpresto released in 1994, called "Character Sheets." Though any of the images in this Banpresto poster set is hard to find, this particular Tenoh Haruka one is super rare, which is why I’m so happy to be able to show it off. Enjoy the scans! No secret that I am an avid collector of Bishoujo Senshi Sailor Moon doujinshi. 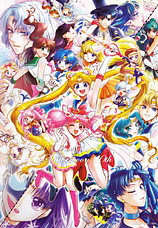 There are various super talented artists out there, who create wonderful Sailor Moon artwork. Some of my favorite doujinshi artists are Studio Canopus, Hello World, Mad Tea Party, Hino Ryutaro, etc. I am now adding the group Bebop//Dog//Duo to my list of favorites, because they are simply amazing. 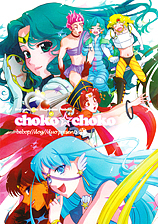 Bebop//Dog//Duo came onto the Bishoujo Senshi Sailor Moon scene in March 2011 with the doujinshi Choko★Choko. The doujinshi included short funny stories about the Amazon Trio, Haruka & Michiru, Sailor Lead Crow & Sailor Aluminum Siren, Sailor Starlights, and Seiya & Usagi. Bebop//Dog//Duo’s beautiful artwork immediately made them popular within the international doujinshi community, and they have gone onto successfully releasing other wonderful Sailor Moon doujinshi titles and products. I look forward to adding more work by this wonderful doujinshi group in the near future! They have a new one called "Treasure GET!!" out, and even participated in some Three Lights doujinshi anthologies titled, "Stage On!!" Hope you guys become fans of Bebop//Dog//Duo too. Hello everyone! Today, I am adding in scans from the super ultra rare Sailor Moon S Nakayoshi Anime Album Vol. 2 book. Along with Kodansha’s Sailor Moon SuperS TV Magazine Deluxe book. Both periodicals cover the same arc in the Sailor Moon S series, which was the second half of the third season, after the Talismans have been discovered. There are tons of gorgeous Sailor Saturn and Mistress 9 images in both books. Further details about Witches 5, Death Busters, and Professor Tomoe Souichi are also included. You are currently browsing the Three-Lights.net Blog archives for September, 2012.